957QTR6SEFR6 Please accept my very best wishes for your holiday season. I am looking forward to my daughter coming home for the holidays from her job in New Mexico. She’s bringing home her newly acquired skill of cooking with chilis. I’ll be keeping a glass of water handy. I’m sure you have family reunions planned as well and, if you’re like me, you will put aside whatever professional concerns you have and concentrate on what’s truly important. It’s been an interesting year and a half of publishing this blog. I have plenty more on my mind and I’m determined to share it with you (lucky you!) in 2012. There are big changes in the real estate world coming and I’m trying to decide how to comment on them without getting fired. In the meantime, this time of year reminds me of past Christmases: lugging the 9 foot tree off the roof of the car and inside the house (the marks where it scraped the ceiling are still there). After that it was an engineering feat with wire and nails to keep it from toppling. 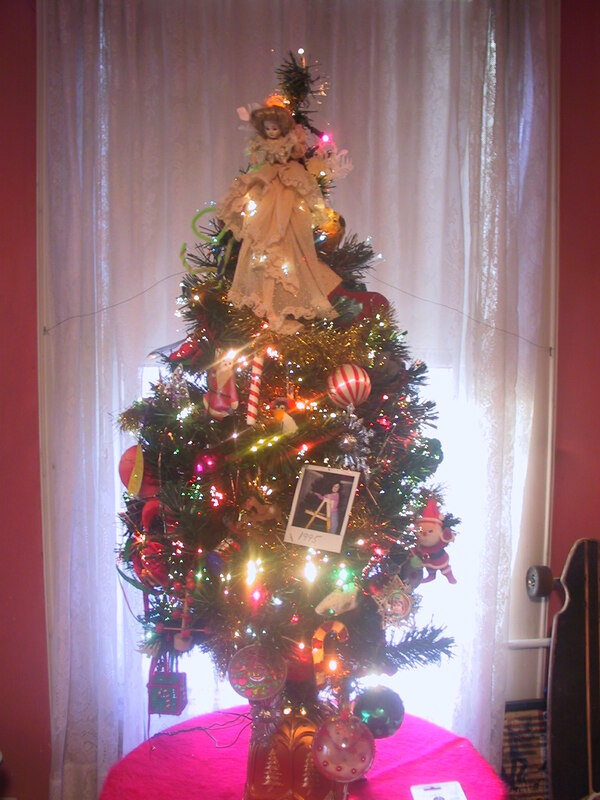 We accumulated enough store-bought and personalized ornaments to fill a 9 foot Douglas Fir. Then, about 4 or 5 years ago my daughter wondered why we were still killing ourselves with such a big tree (thank you, Lord!). The little tree that could! A trip to KMart produced a 3 foot artificial tree which now groans under the weight of all those ornaments. We now have a new tradition: The little tree stays decorated in the basement from January on and is ceremoniously brought upstairs at Christmas and placed on a table, plugged in (9 foot tree worth of lights as well) and the tree chore is completed. 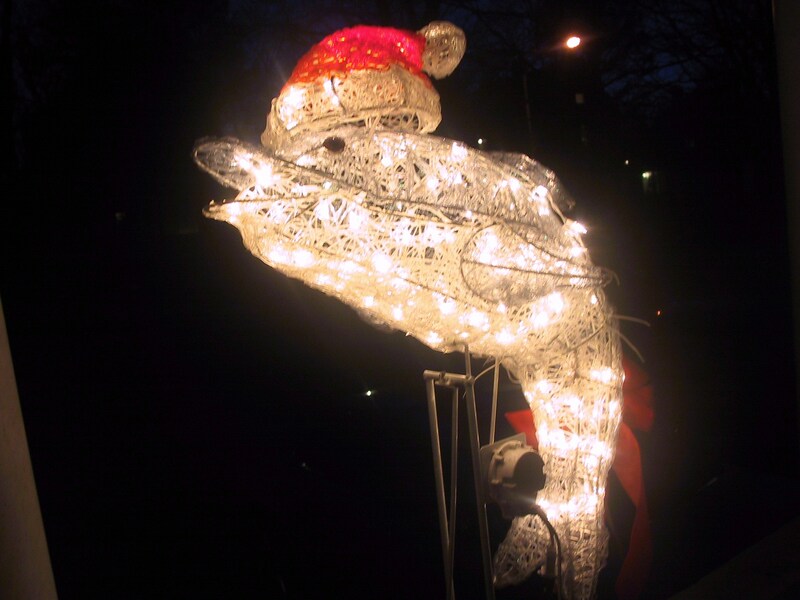 We also have an outdoor, lighted, animated, Christmas dolphin thanks also to KMart. It was so stupid we had to have it and we proudly confound our neighbors every year with a dolphin aglow in Christmas lights, in a Santa hat, bobbing on our front porch. The Christmas Dolphin. You know you want one! I’m sure you also have your cherished holiday traditions. I’m also sure yours are more adult than those mentioned above, but whatever they are, they are an important part of your family’s rhythm at this time of year. When my daughter was small, we indulged in all the traditional rituals that a child would enjoy. Now, she tells me she very much enjoys our new rituals, more in tune with the slightly askew sensibilities of a grown-up and an almost grown-up (me). The point is, your observances may change but the importance of the people around you does not. Well, I’ve managed to populate this post with not much real estate at all. It was very refreshing. Some of my colleagues are returning from the recent New Jersey REALTORS’ convention in Atlantic City. I did not attend and they will be regailing me with all they’ve learned and I’ll pretend to be interested. No, really, it’s a very worthwhile pursuit and I’m sure it has prepared them to have a banner year next year. I stayed home and actually worked. You may have noticed the blog widgets on the sidebar of the blog. These are blog registry sites that I am on and if you click any of them, you’ll be brought to their sites where you can peruse other blogs in many categories. I also have a Feedburner feed which you can explore. You can access it at http://feeds2.feedburner.com/wordpress/FVJF or just click on the orange RSS feed on the sidebar that says “Subscribe in a reader”. The funny alphanumeric code at the beginning of this post is a tracking code for that feed. It’s a one-time thing and will not be showing up in the future. I am also listed at Technorati.com which, I am told, is a very prestigious posting (I’m on page 28 of the real estate blogs as of this writing http://technorati.com/blogs/directory/business/realestate/page-28/ – so much for prestige). You can also access my blog at Technorati at http://technorati.com/blogs/www.jamesstefanile.wordpress.com . The purpose of all these listings is to expand readership, increase Google rankings, implement search engine optimization, and to explore what other folks in the “bloggosphere” are writing. Finally, once again, enjoy your holidays, your loved ones and friends and your unique holiday traditions. We need these to counter the more annoying need to make a living the other 364 days of the year.